Cream of the Crop Video Slot Guide & Review - Casino Answers! 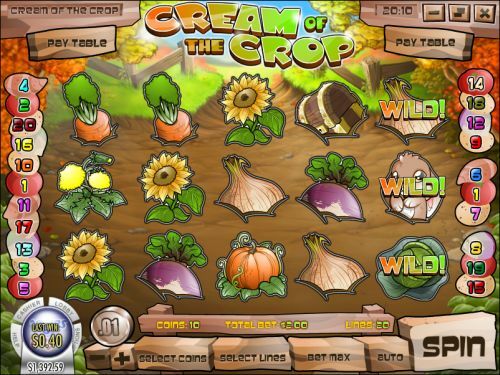 Cream of the Crop is a 5-reel, 20-line video slot developed by Rival Gaming, featuring expanding wilds, free spins and a bonus game. You can play the Cream of the Crop video slot at Bovada. Coin sizes on the Cream of the Crop slot machine are $0.01, $0.05, $0.10 and $0.25. You can select 1-20 paylines and bet 1-10 coins per line on a spin on the Cream of the Crop online slot game. You can bet as little as a penny on the Cream of the Crop penny slot and as much as $50 per spin. Cream of the Crop has a decent betting range, which is perfect for casual players. To play the Cream of the Crop slot game, select your bet and press the “Spin” button. You can also use “Bet Max” to play all 20 lines with 10 coins per line. The highest paying symbol on the Cream of the Crop slot machine is the Corn symbol. 5 Corn symbols on a selected payline will pay out the 8888 coin top jackpot. The second highest paying symbol is the Pumpkin symbol, which can pay up to 750 coins. You can win lots of cash by hitting these jackpots at Bovada! The Bunny symbol is an expanding wild on the Cream of the Crop video slot. Whenever it appears, it will fill the entire reel to form new wins. The wild symbol will substitute for all other symbols except for scatter symbols. The Bunny expanding wild symbol only appears on reels 1, 3 and 5. Payouts are displayed on the Paytable. Winning combinations must appear consecutively from left to right on any active payline. Only the highest win is paid per selected payline. All wins are multiplied by the bet per line, except for scatters. All wins pay left to right, except for scatters (which pay any). 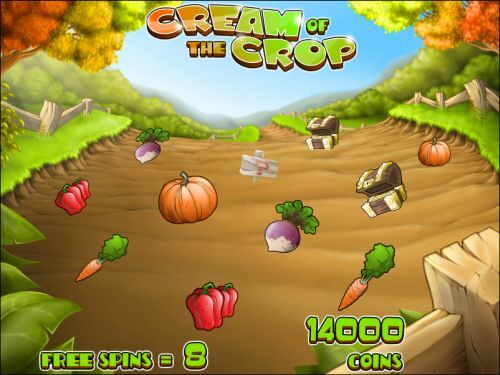 Cream of the Crop has an autoplay mode available for real money players only. To access it, press the “Auto” button. You can play from 1-500 autoplay spins, stop when your balance increases/decreases by $1-1000, stop on any win and set a delay between spins of 0-10. You can stop the autoplay mode on the Cream of the Crop video slot at any time by pressing the “Stop” button. The first thing you will notice about Cream of the Crop is its interesting presentation. It fits in great with the theme and lets you look at something other than spinning reels when you play. The actual game features are great too – a large top payout and a bonus game with prizes and free spins. You can play the Cream of the Crop video slot for real money when you sign up and make a deposit at Bovada! Where can USA players play the Cream of the Crop online slot game for real money? Where can I play an Instant Play no download version of Cream of the Crop? You can play a Flash version of the Cream of the Crop video slot for free or real money at Bovada. If you have problems with the Instant Play casino, make sure you have the latest version of Adobe Flash Player installed on your computer.